Wielkość pliku podglądu PNG dla pliku SVG: 520 × 595 pikseli Inne rozdzielczości: 210 × 240 pikseli | 419 × 480 pikseli | 524 × 600 pikseli | 671 × 768 pikseli | 895 × 1024 pikseli. Plik Royal arms of Cambodia.svg znajduje się w Wikimedia Commons – repozytorium wolnych zasobów. Dane z jego strony opisu znajdują się poniżej. 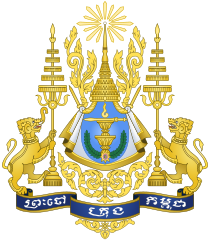 English: Royal Arms of the Kingdom of Cambodia. Depicting: a Golden sword atop two ceremonial bowls, above it is the sacred "Aum", below is a laurel wreath and the Royal Order. The Arms is supported by two creatures, a gajasingha and a singha, they are holding two five-tiered royal umbrellas. Atop the arms is the Royal crown with rays of light emitting from it. Below is a ribbon with the words in Khmer script: "Preah Chao Krung Kampuchea": "King of the Kingdom of Cambodia". In order to be hosted on Commons, all works must be in the public domain in the United States as well as in their source country. Kod źródłowy tego pliku SVG jest niepoprawny z powodu błędu. Ten niezgodny z W3C herb został stworzony za pomocą Inkscape, or something else. This SVG coat of arms uses the path text method.